The following post is part of our Law Student Blog Writing Project, and is authored by Dayna Wilson, a law clerk at Lawrence and Associates, who is pursuing her Juris Doctorate at Chase College of Law. A loved one suffering a death on the job can be painful and extremely traumatizing. Determining which benefits a family is entitled to can be a rigorous and complex process. This process can be can be made significantly easier if you have an experienced workers’ compensation attorney who can thoroughly explain and guide your through the procedures. Lawrence & Associates will strive to ensure that you receive the compensation you deserve after a fatal death of a loved one. In Kentucky and Ohio there are slightly different benefits that loved ones may recover. This blog is designed to provide you with a better understanding of workers’ compensation death benefits. Who Can Recover Death Benefits in Kentucky? Losing an income earner can be financially difficult for a family. When the death of a loved one would not have occurred but for an on the job injury, the deceased’s surviving family members may be entitled to benefits under the Workers’ Compensation System. First, the people who are eligible to recover benefits in Kentucky include: a surviving spouse, minor children of the deceased worker, mentally disabled adult children of the deceased worker, and the parent of the deceased worker, if he or she had no spouse and no children. (b) To the widow or widower, if there is a child or children living with the widow or widower, 45 percent of the average weekly wage of the deceased, or 40 percent, if such child is not or such children are not living with a widow or widower, and in addition, 15 percent for each child. When there are more than two children involved, benefits shall be divided among the children. According to Kentucky Guidebook to Worker’s Compensation, if an employee dies as a result of a work- related injury, a lump sum payment will be made to the deceased employee’s estate. If an employee’s death occurs within four years from the date of injury, as a direct result of the injury, a lump sum payment to the estate will be made from which burial expense are to be paid. The surviving spouse and certain defendants are also entitled to income benefits. Currently, Kentucky’s death benefit is $83,336.22. This amount is paid into the deceased worker’s estate. The next statute that may apply to your situation is Kentucky Revised Statute 342.730 (3) when an employee, who has sustained disability dies from causes other than the injury but is otherwise still able to recover benefits. (b) If there are both a widow or widower and such a child or children to the widow or widower 45% of the benefits specified in the award. If a child is not living with a widow or widower then 40% of the benefits specified in the awards. (c) If there is no widow or widower but such a child or children, then to then the children are entitled to 50 % of the benefits specified in the award. As you can see, this process can be quite complex and complicated. Therefore, it is in your best interest to contact an experienced Workers’ Compensation attorney to assist you with your rights to recovery. How do you become Eligible for Survivor Benefits in Ohio? Similar to Kentucky, Ohio has strict rules set up to pay workers’ compensation benefits to the family of a fatally injured worker. If you are a surviving spouse, minor child of the deceased worker, or mentally disabled adult child of the deceased worker. In Ohio there are three types of benefits available to the family. The family may be eligible for a lump sum, payment of medical bills before death, and a benefit to dependents that is paid on a weekly or bi-weekly basis from the date of the worker’s death onward. Workers’ Compensation will pay 100% of your medical bills directly to the provider. Unfortunately, Pursuant to Ohio Revised Code 4123.66 an individual may not recover more than $5,500 for funeral expenses. This statute puts many families in an unfortunate situation because it will often times provide inadequate relief for the suffering family. I am sure you can imagine; this number seems completely unreasonable for the amount of pain and suffering incurred by the deceased family. Again, like Kentucky, if you are wanting to recover damages such as pain and suffering, loss of guidance or loss of consortium you would have to file a civil lawsuit. A spouse will receive death benefits until he or she dies or remarries. Upon remarriage, the spouse will receive a lump sum of two years’ worth of benefits. If you are a dependent of the deceased worker, under ORC 4123.59, as long as you are a spouse or child, both can receive two-thirds of the “average weekly wage” the worker had before he or she died. A child is able to collect this benefit until the child turns eighteen. If a child is still in school, benefits will continue until the child turns 25 or unless the child is incapable of having a job for other reasons. For other family members, the Bureau decides how long benefits continue. What are the Time Limits for a Death Claim? Dependents must file a claim for death benefits with the Ohio Bureau of Workers’ Compensation within one year of the worker’s death. In Kentucky, for the death benefits provided by the Kentucky Workers’ Compensation Act, the time limitations period is two years, and begins to run from the time of death. Why Choose Lawrence & Associates for Workers’ Compensation? According to the Bureau of Labor Statistics in 2016 there were 164 fatal occupational injuries. Falls, slips, or trips was the third-most frequent work event with 29 fatalities, unchanged from the prior year. When a worker passes away from a work-related injury a worker’s surviving family is eligible for benefits. 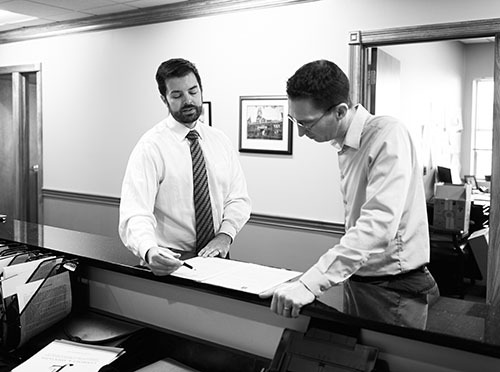 An experienced workers’ compensation attorney will help you receive your deserving benefits. Here at Lawrence & Associates we will handle your workers’ compensation claims and make this difficult process a little easier for you and your family. We’re Working Hard for the Working Class, and we want to help you!